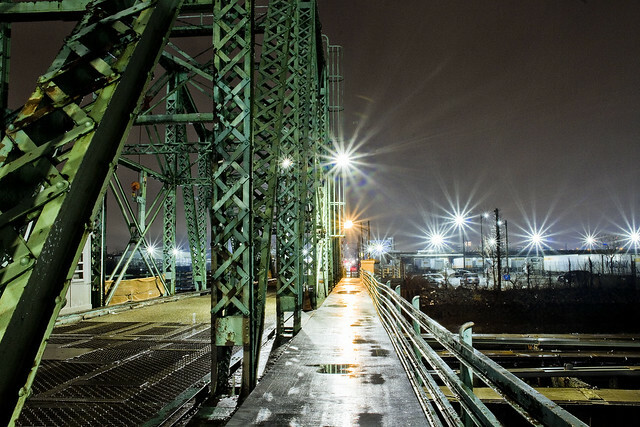 Borden Avenue Bridge and environs, in today’s post. There have been three Borden Avenue Bridges, the first being a wooden draw bridge that opened when Borden Avenue was created in 1868. It was replaced by an iron swing bridge which was demolished in 1906, and the modern day retractile bridge was opened on the 25th of March in 1908. It cost $157, 606 to build in 1908. That would be $4,365,073 in modern money, adjusted for inflation. Borden Avenue Bridge is one of only two retractile bridges in NYC, the other one being the infinestimal Carroll Street Bridge over the Gowanus Canal. 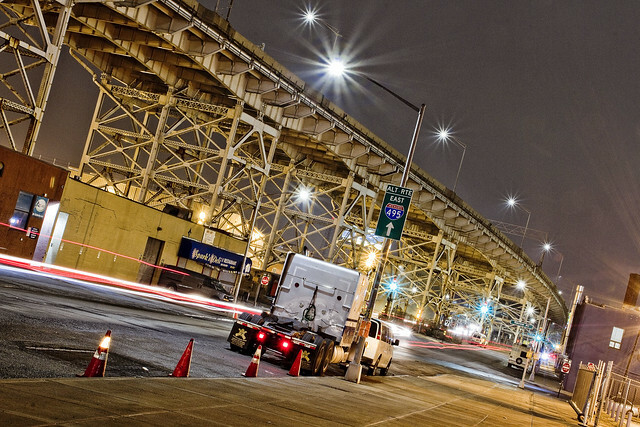 This specie of movable bridge is actually quite common in other cities, notably Chicago. Chicago ain’t got a view like the one above though, I’d wager. 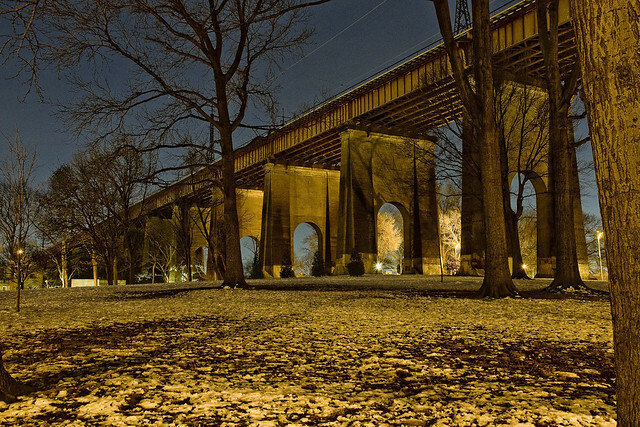 To the south of Borden Avenue, one might notice the two railroad bridges spanning Dutch Kills – Cabin M and DB Cabin. 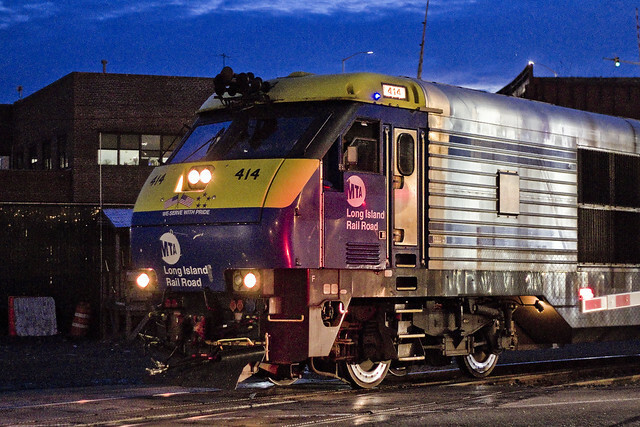 The latter carries traffic for the Lower Montauk Branch of the LIRR from the Wheelspur to Blissville Yards, all of which which are mainly used for freight these days. 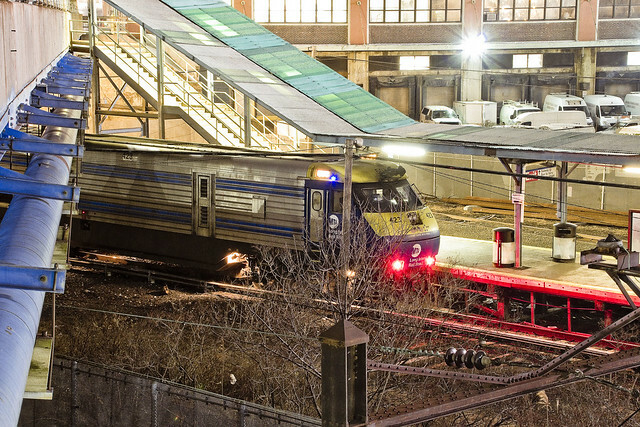 Cabin M connects to the Montauk Cutoff, a now severed connection to the Sunnyside Yards and the LIRR Main Line tracks. Just beyond the two rail bridges is the main body of Newtown Creek. Dutch Kills itself, in this area around the Borden Avenue Bridge, is stagnant and choked with wind blown garbage. A tepid current in the water creates a vertical rather than horizontal flow pattern, which factors into the accretion of sediments on the bottom. These sediment beds, which are found across the entire Newtown Creek watershed and represent a centuries long cross section of industrial and municipal pollution, are the reason that the Creek and its tributaries are a superfund site. At low tide, mounds of this material become exposed to the air. For many years, there was a shanty dwelling here, occupied by some unknown entity. Hurricane Sandy ended that tenancy. My chosen path next carried me eastwards on Borden Avenue, away from my beloved Creek and deeper into the post industrial landscape of Long Island City. The concrete devastations were calling to me. 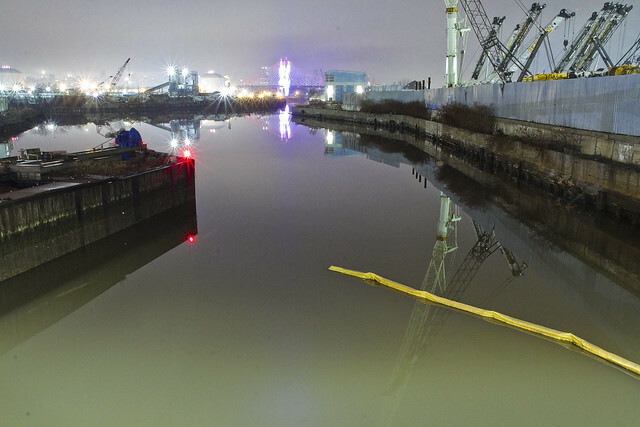 After dark peregrinations about the Newtown Creek. 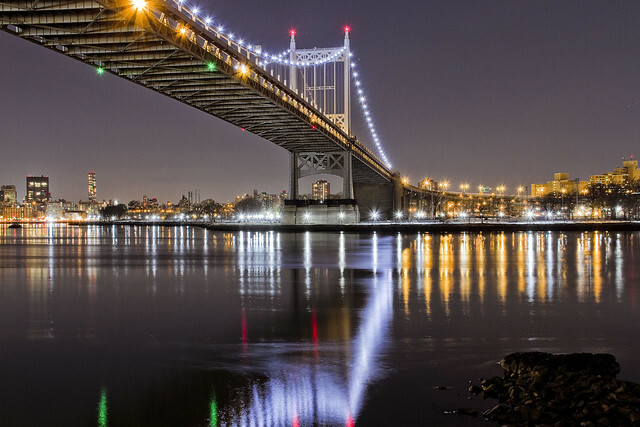 That’s the Hunters Point Avenue Bridge pictured above, a centuried single bascule drawbridge. Your humble narrator was actually a Parade Marshal for the centennial celebration, back in 2010. The first Hunters Point Avenue Bridge, which sat on roughly the same spot, was erected in 1874 and was made of wood. It opened and closed thanks to a mule walking on a turntable. 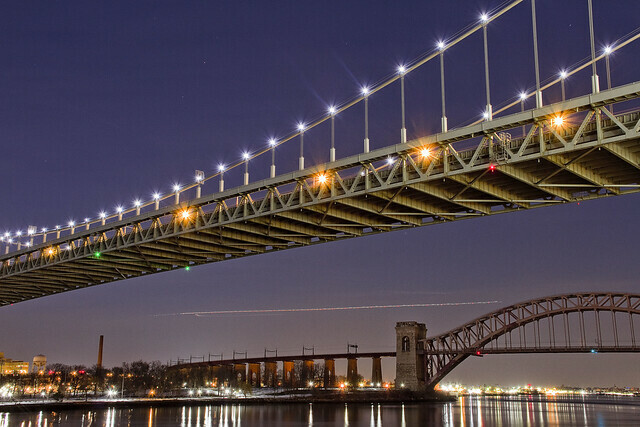 The modern bridge is the property of the NYC Department of Transportation, and the agency has been working on the span since last summer, repairing and upgrading electronics which were damaged by Hurricane Sandy back in 2012. The water it overflies is the Dutch Kills Tributary of the Newtown Creek, which branches off of the main waterway about 3/4 of a mile from the East River. 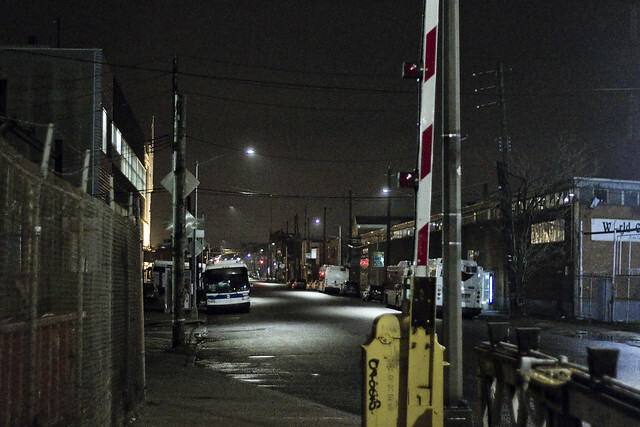 Dutch Kills itself, in its modern incarnation, is about 3/4 of a mile long. It once ran all the way through the modern day Sunnyside Yards and fed into a marsh/swamp which would have been centered at 29th street and Jackson Avenue in LIC. That’s just before the elevated Subway breaks off to the North along 31st street and Jackson widens to become Northern Blvd. 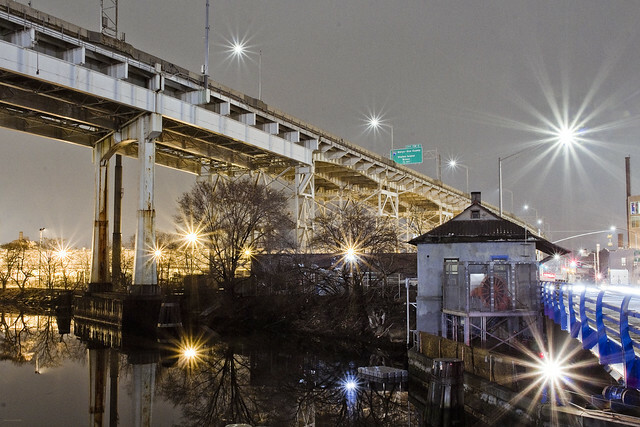 Over the years, one has spent a considerable amount of time along the canalized shorelines of Dutch Kills. There’s a mega structure crossing it, the truss carrying the Long Island Expressway some one hundred and six feet over the water. November 15th of 1940 is when this section of the LIE opened, and the “high speed road” carries vehicle traffic first to the Queens Midtown Tunnel and then into Manhattan. Looking to the north/west, the turning basin of Dutch Kills and the remains of the Degnon Terminal. A turning basin is an engineered section of a waterway shaped to allow an articulated tugboat and barge egress to rotate and turn around. 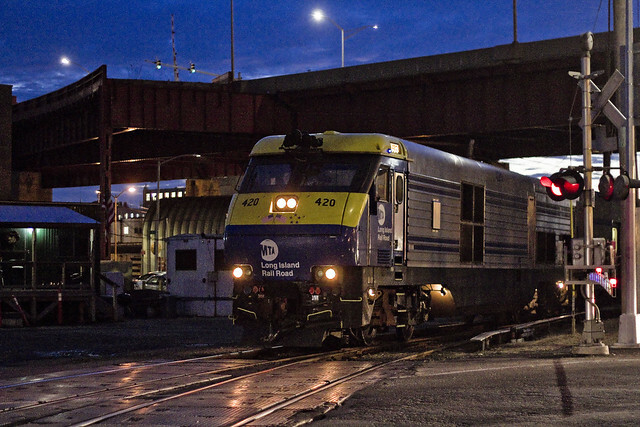 The Degnon Terminal offered ship to rail connections back in the early 20th century, and cargo could be loaded or unloaded onto a terminal railway or onto freight cars of the Long Island Railroad for delivery to extant points. 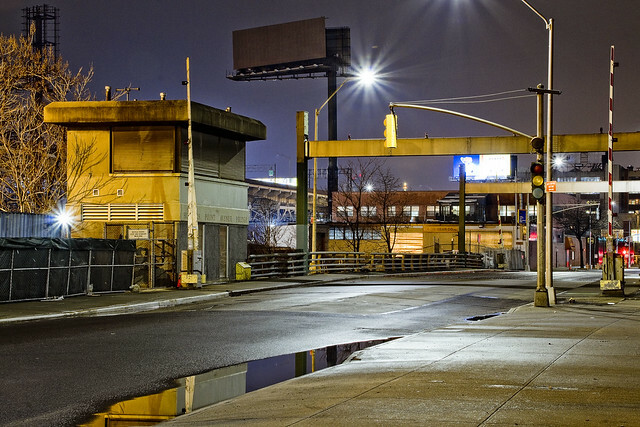 On the east side of Dutch Kills, the FedEx people have a large shipping depot that squats squamously. 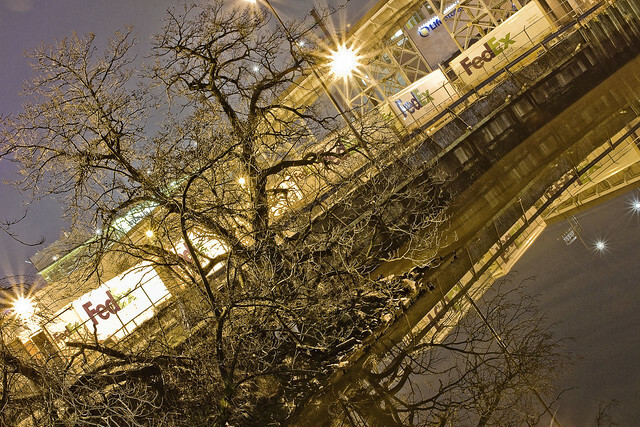 A LEED certified facility, the FedEx property nevertheless logarithmically magnifies the number of trucks worming through traffic to LIC every day from Kennedy Airport. Semi trucks carry FedEx cargo here from the airport, delivery vans carry it out to their end customers. When these shots were captured, the air was terribly still. 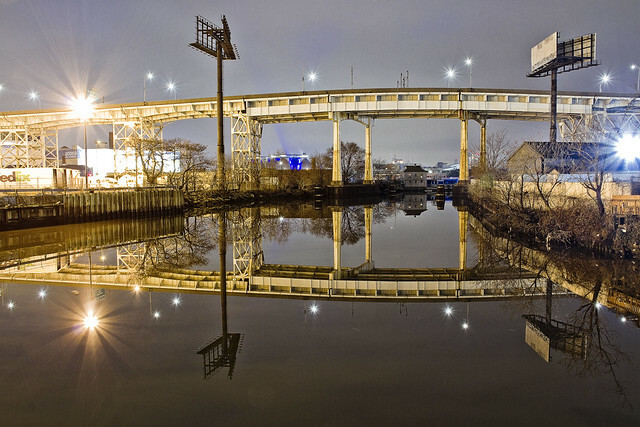 Without any sort of atmospheric perturbence, the tepid currents of Dutch Kills’ fluids barely register as a ripple on the surface. Last time I checked, the LIE carried about 90,000 vehicle trips a day in this section (called the Queens Midtown Expressway), which translates out to around 32 million vehicles annually. The drains on the LIE are not connected to the City’s sewer system and instead drain directly into Dutch Kills. At least there’s some current, I guess. My path next carried the camera south to Borden Avenue. The street dates back to 1868, when it was built as a plank road through the swamps surrounding Dutch Kills. It got its name in a traditional fashion for the 19th century, named for where it was going. It used to be the pathway to the Borden Dairy farm up the hill in Maspeth, and was constructed to allow easy egress for fresh milk to travel to market in Manhattan and beyond. It rained all day on Sunday, whereupon a non precipitatating mist set itself up in the atmosphere during the evening hours. Given my recent fascination with wandering about the darkened Newtown Creek watershed in such conditions, a humble narrator strapped on the camera kit and debarked HQ for Long Island City. 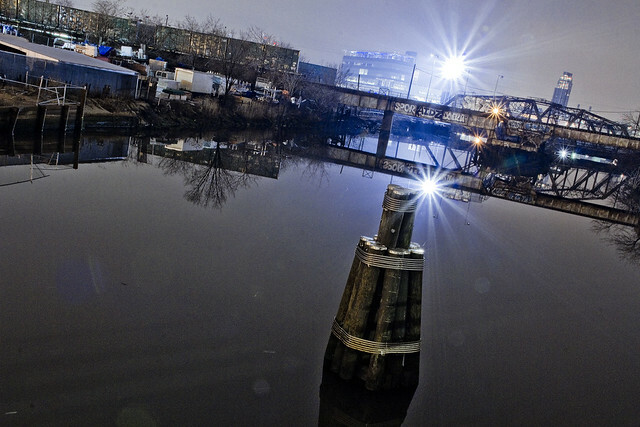 My target for this photo excursion was a section of the waterway found in Long Island City, specifically the Dutch Kills tributary. 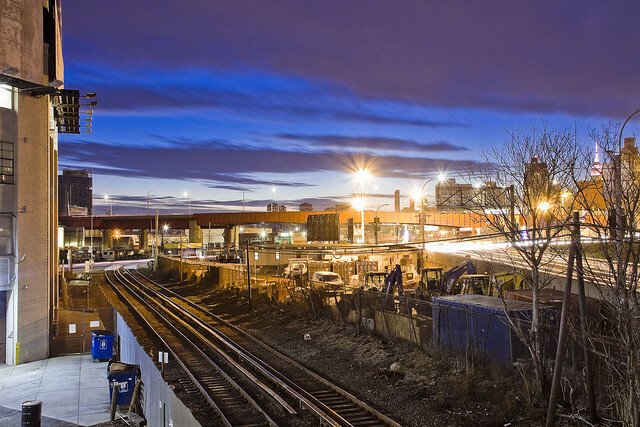 Pictured above, looking across Skillman Avenue and the “A section” of the Sunnyside Yards towards Jackson Avenue and the Sapphire Megalith. A decade ago, one used to refer to this area as “Lonely Island City” since you’d seldom see anything other than a stray or lost human back here. 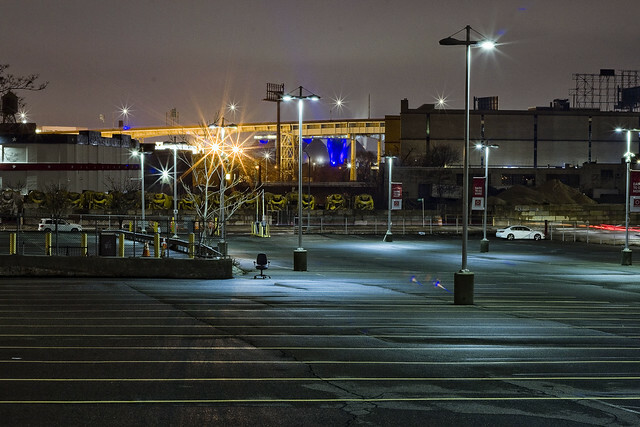 The “zone” around the Degnon Terminal was largely deserted until recent years, when the Real Estate Industrial complex began to construct large dwellings on former industrial land along Jackson Avenue and elsewhere in LIC. All of a sudden, the humans began to appear back here. Where can a guy go to be alone with his thoughts in Western Queens these days? Always somewhat nocturnal, a humble narrator’s solution to the presence of the human horde has simply been to shift my schedule a bit. This causes loved ones no end of worry, me wandering about in the darkness all by my lonesome. 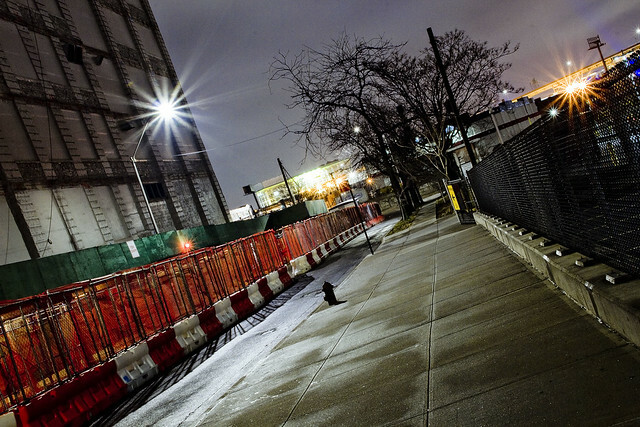 You’re never unobserved or truly alone in Long Island City, it should be mentioned. In the cupola of the Sapphire Megalith, there is an impossible thing which cannot exist that is always watching you with an unblinking three lobed burning eye, after all. It hungers for profit and employs an army of acolytes to do its bidding. Additionally certain precautions are taken, including the usage of a reflective construction worker’s vest which is roughly worn over the filthy black raincoat. Last week, in the comments, somebody asked if I carry a firearm when I’m out at night shooting to protect myself from malign passerby who might want to rough me up in pursuance of stealing my camera or emptying my pockets. I don’t. Were a stranger to strike me, filth and disease would crawl up their arm causing them to collapse into a pile of mouldering meat and rotting bone. That’s what I’m packing – plague and death are the horsemen I ride with. Atmospherically, everything was pretty much what I hoped it would be when leaving Astoria for points south and west. The mists and clouds were largely at high altitude, and only ribbons of fog were present at ground level. My plan for the evening was to spend only a few hours wandering about, but I actually ended up being out for nearly six hours, whereupon I returned to HQ and developed the shots I had captured. One didn’t get to bed until about five in the morning, hence the late post you’re reading right now. One did not experience any missing time, as a note, I was working the whole time. If I was abducted by a UFO, I’m certain that shots of it would have been on my camera card when I got home. 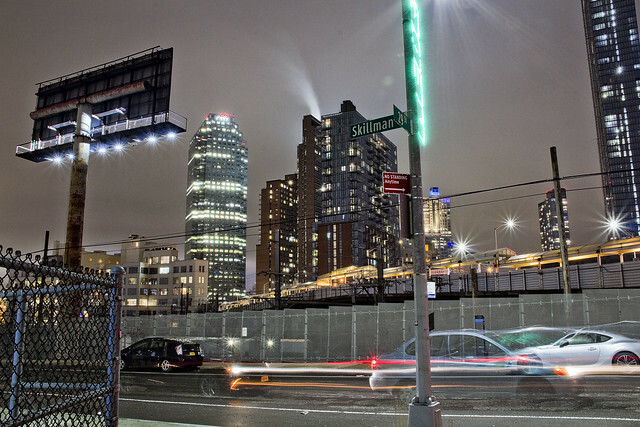 Pictured above is 29th street along the Dutch Kills turning basin, looking back at the gargantuan complex of residential luxury buildings erected within the last decade in the Court Square area of LIC. The thing in the Megalith has won. 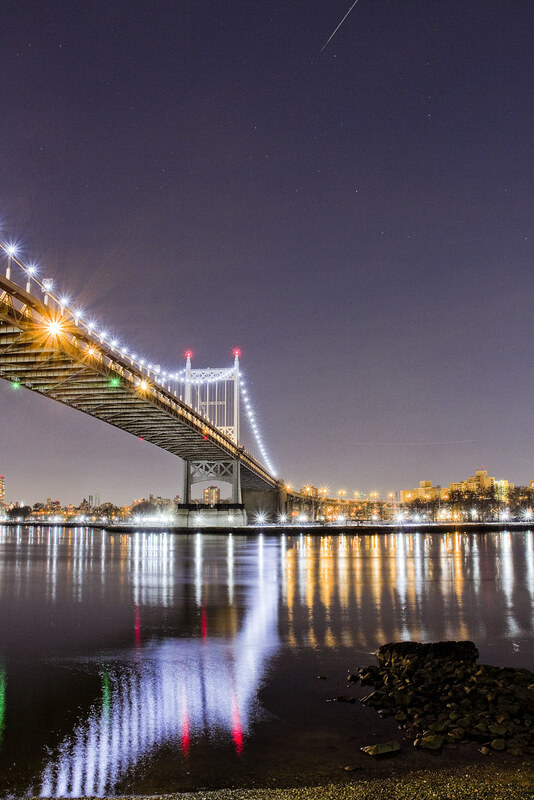 Whilst wiggling about and adjusting the camera settings to capture the image above, a humble narrator was photographed by the occupants of a passing minivan (which slowed down to do so) on Shore Bouelvard alongside Astoria Park last Sunday. The largish iPhone brandished at me skillfully ignored all the folks engaged in romantic congress in the front seats of their cars, or the small army of marijuana enthusiasts who were similarly situated in the parking lane. Clearly, the iPhone person had uncovered some nefarious activity being committed by a strange old man in a filthy black raincoat, and would be reporting so to the proper authorities. I was waiting for the goon squad to arrive and kick in my front door back at HQ later that night. 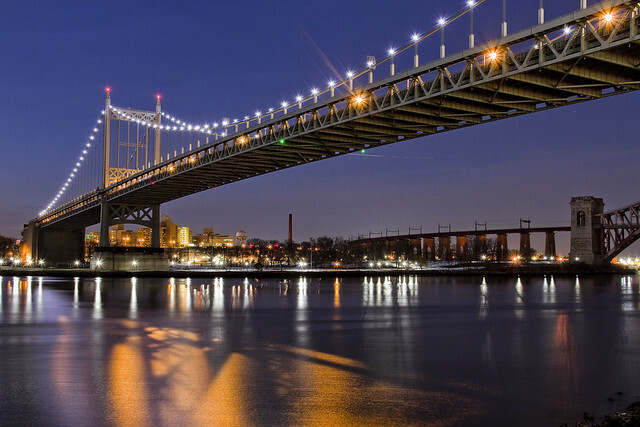 Mighty Triborough, and the Hell Gate Bridge, in today’s dark light post. There is just something about camera equipment that sets off the accent crowd here in Astoria which I’ll never understand. It’s kosher to wave your phone around wherever you go, but if they see a DSLR, it’s regarded with the same sort of caution and concern that you’d expect for brandishing an assault rifle. Given that the times I’m not carrying a camera are so rare that they are statistically irrelevant, it means that I get stared at a lot. I’d get stared at a lot even if I wasn’t carrying the camera, as a note. Children gasp or cry, dogs growl, old ladies clutch at their purses… all things that happen when one such as myself scuttles past. Men puff themselves up and assume aggressive posture, police slow down and observe, security cameras pivot on their swivels. The only living creatures which do not react negatively to me are birds, and one can walk through a flock of them pecking away at the ground with nary a ruffled feather. A few years ago, whilst wandering about, I snapped a quick photo of the facade of a local Greek church – St. Irene’s. A small mob of old Greek ladies suddenly appeared and literally chased me for about 3/4 of a mile. I favor atmospherics like fog for these kind of shots, normally, but for structures as massive and far reaching as Triborough and Hell Gate – fog and mist get in the way and obscure too much detail. 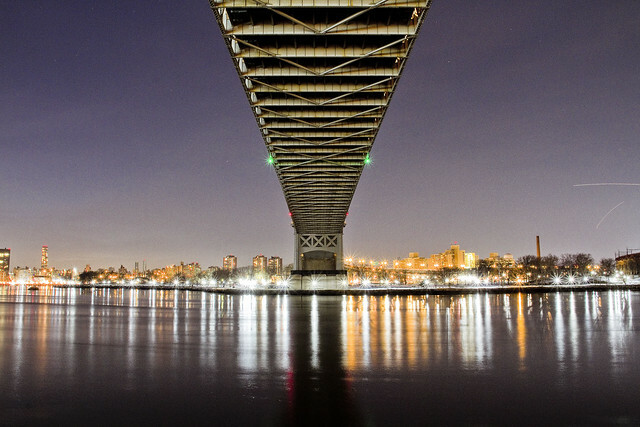 It’s particularly dark on this section of the East River as well, which causes any sort of artificial lighting to flare due to the contrast. I walked into Astoria Park to get this final shot of Hell Gate. I do wish Amtrak would light this bridge up at night. Cuckoo for Cocoa Puffs, me. Towards the end of last week, a humble narrator found himself over in the Shining City of Manhattan. I had business to discuss with somebody, mainly creating a new walking tour route, and we actually stomped out one of my proposed routes (Wall Street to 23rd street via the “East River Greenway”) after which one found himself at the NYC Ferry dock at 34th street. 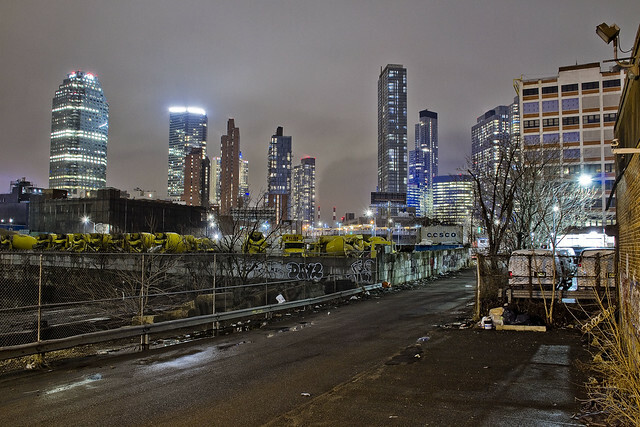 A quick journey across the river to Long Island City, as the burning thermonuclear eye of God itself slipped behind New Jersey, soon found me scuttling about in a Long Island City which was cloaked in preternatural darkness. The tripod was deployed and a humble narrator got busy with the camera, which seemingly generated much interest for both private security personnel and ordinary passerby. Click, whir, click. 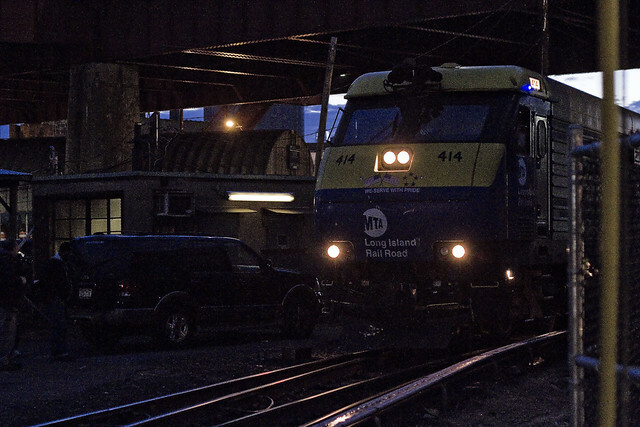 That’s a LIRR train idling at the Hunters Point Avenue station, if you’re curious. The crap hole security fencing around the Sunnyside Yards doesn’t do much to actually secure the railyard, but it does get in the way of your shots. In many ways it’s a metaphor for the entire MTA. 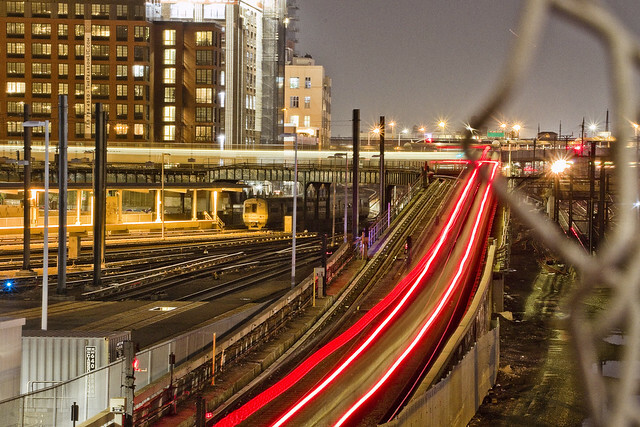 Pictured above is a long exposure of the 7 line subway exiting the Hunters Point Avenue station, and climbing onto its elevated course towards the next stop – which is the Court Square station. 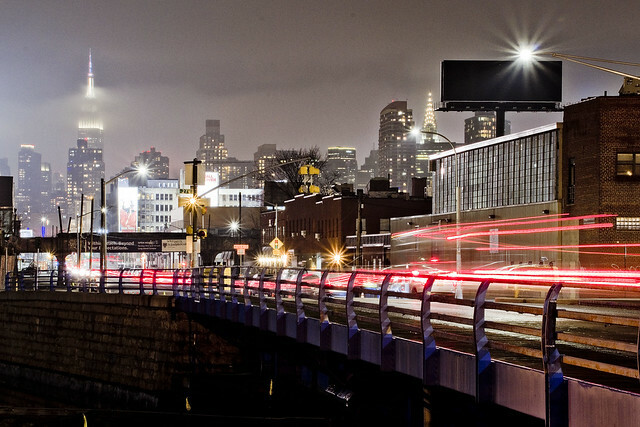 Another long exposure shot, this time from the 54th avenue footbridge over the tracks, looking westwards towards the Pulaski Bridge and the Queens Midtown tunnel. I would have waited for a train to roll by, but on my way to this spot, two LIRR units had just transited by (see below). Like a lot of the shots recently presented here, this is a narrow aperture and low ISO sensitivity photo with an exposure time of about thirty seconds. That’s where all those light trails come from. 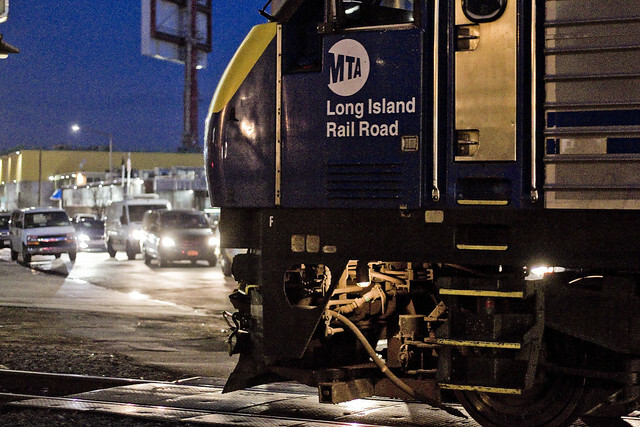 I was on Borden Avenue, and heading for the 54th avenue footbridge, when the signal arms came down and the parade of LIRR rolling stock began. 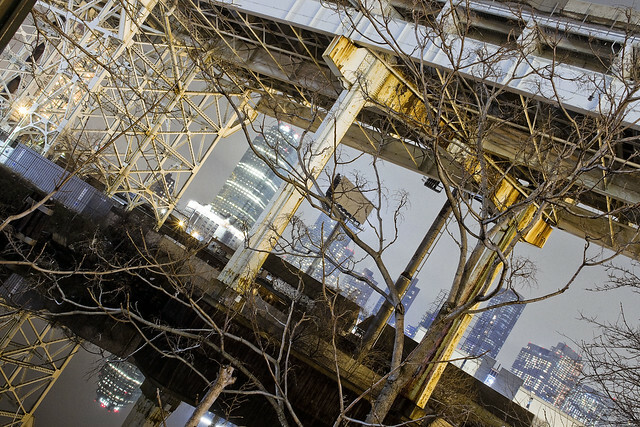 As a note, the shots above and below are handheld exposures, unlike the ones above. One thing about all this night shoot stuff I’ve been up to lately is the need to be able to switch back and forth between the two strategies utilized for low light shots. In the case of these passing trains, I wanted to “freeze” the moment, so they are wide aperture and high ISO shots representing about 1/200th of a second, give or take. Proponents of the proposed “BQX” trolley line really should spend some time on Borden Avenue at rush hour to observe what an “at grade” crossing looks like on a well trafficked arterial street. Vehicle traffic backs up for blocks and blocks, and any traffic lanes which might intersect with the arterial begin to feel the effect of it within minutes. 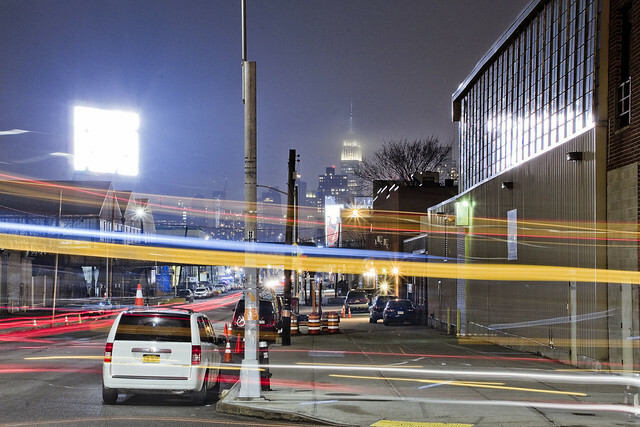 As Robert Moses might have opined, it’s not about about the traffic, it’s about the flow. The tracks which the LIRR units are heading onto in this series are the ones you saw in the tripod shot from the 54th avenue footbridge. They lead into the Sunnyside Yards and the trains are going to be heading eastwards, I’m told, towards first Woodside and then Jamaica and then out to Nassau and Suffolk Counties. After unit 414 completed its journey past Borden Avenue, number 420 began its own trip. A humble narrator was squealing with glee, as a note, because simple things make me happy. After a day spent in Manhattan, which has become the most boring place on Earth, LIC welcomed me home with this grand parade? I missed you too, Queens. Astoria style Currier and Ives, by request, for George The Atheist. 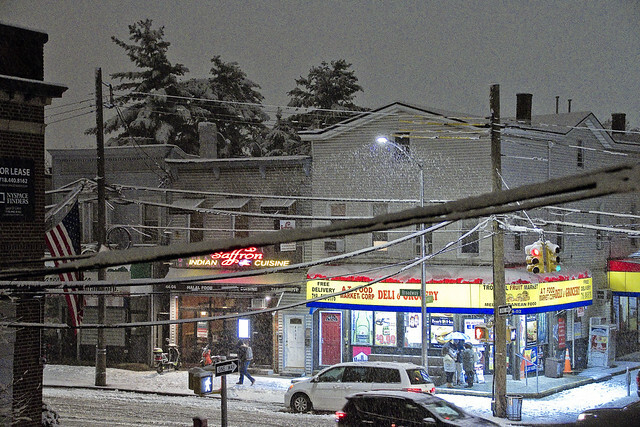 Last week, frequent commenter George the Atheist opined that he’d like to see some wintertime landscape shots offered at this – your Newtown Pentacle – so when the snow began to fall last Saturday, a humble narrator got busy here in Astoria. The bodega/grocery store pictured above is across the street from HQ, owned by a lovely Lebanese family, and is open nineteen hours every day. They’ve recently began a lunch counter in the back of the shop, and I can recommend the Kofta Hero with everything. That is indeed a tripod shot above, but with increased ISO sensitivity and shutter speed designed to capture the individual snowflakes falling. 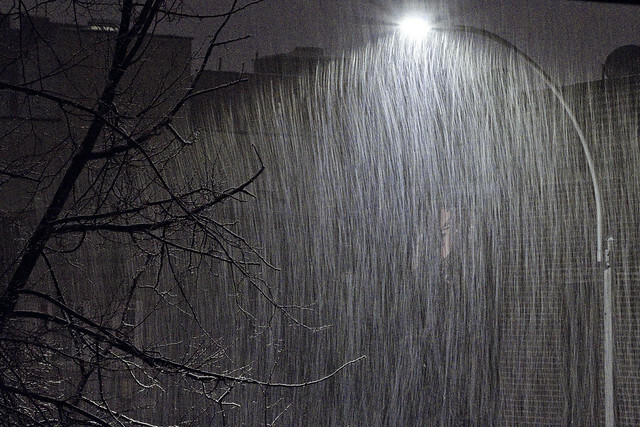 I did a few smoother shots at lower ISO and longer shutter speeds, but the airborne snow tended to smear and disappear in a long exposure – and just illustrated the conical path which the street lamp’s light was following down to the road. The Indian place next door to the bodega is pretty good, if you happen to be in the neighborhood. Try the Salmon Tikka. Above is an example of what happens when you slow things down during weather and accrue some time on the camera sensor, while looking northwards up my block in the direction of one of those new LED lamps which the City has been installing. It’s a whiter and colder light than yesterday’s model of NYC street lamps, which were yellow orange. If you click through on either this or the first shot to my Flickr account, you’ll see that one was experimenting with time and sensitivity in the shots immediately before and after the ones in today’s post. Always messing about, me. The hard part about shooting in any sort of precipitatating atmosphere doesn’t really involve the camera body (plastic shopping bag cover) but the business end of the lens itself, which quickly becomes spotted with moisture requiring maintenance polishes between shots. 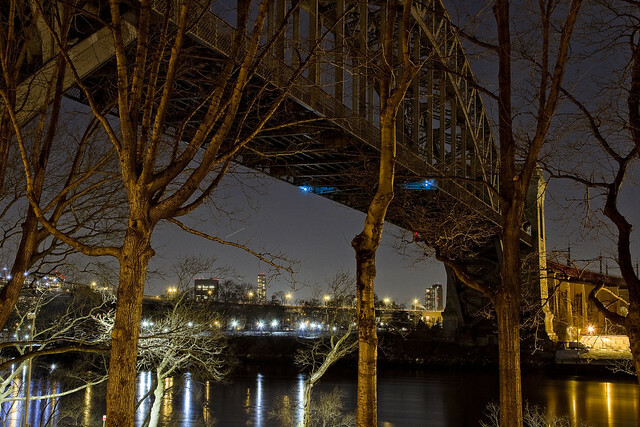 Sunday last, one suddenly found himself in Astoria Park after dark and so a quick “set up” for this shot of the arches of the New York Connecting Railroad, where it feeds rail traffic onto the Hell Gate Bridge, was accomplished. The snow from Saturday was still present, and all lit up by the yellow orange sodium based lighting which is still used by the Parks Dept. I always refer to the half melted stuff as “rotting snow” for some reason. One seems to be obsessed with decay. It would also seem that I take requests. What do you want to see? If it’s reasonable, I’ll try and shoot it. The world is an increasingly scary place, stay home. 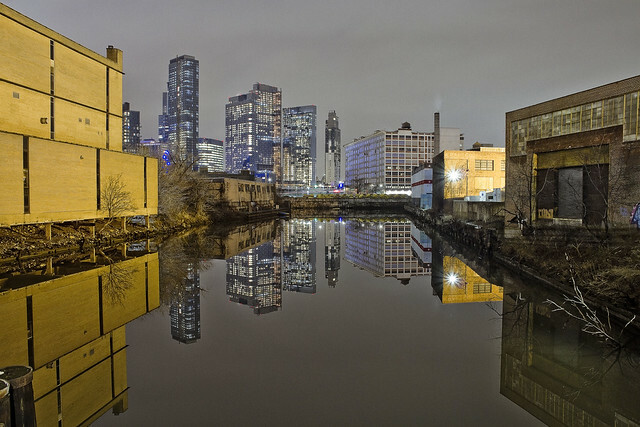 Sunday nights, and in particular the hours directly before the midnight boundary with Monday is breached, are the only time that the Newtown Creek industrial zone slows down and takes a breath. 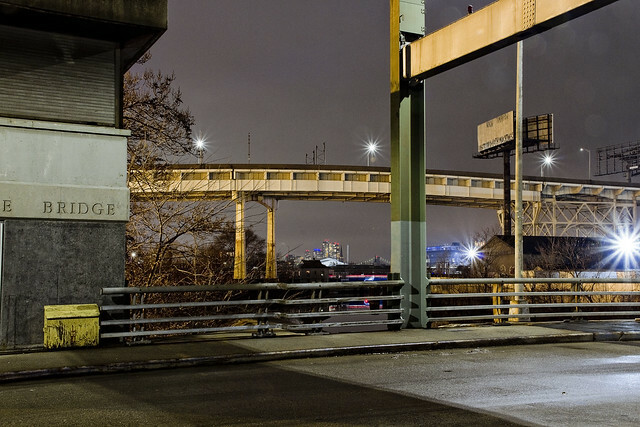 For a few hours the constant river of vehicular traffic, industrial activity, and omnipresent noise ebb. 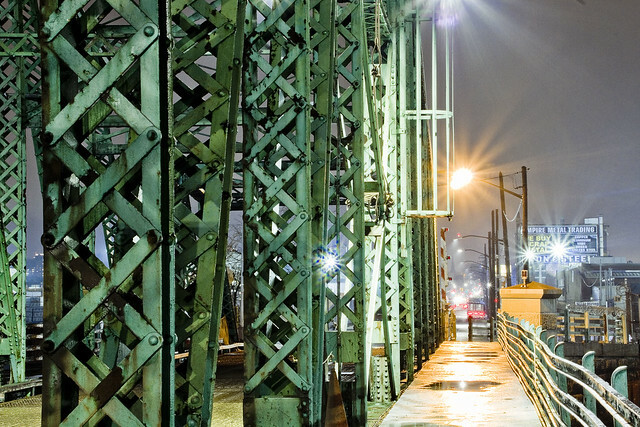 Any other day or time, and you literally would not have the thirty seconds required for some of these night shots at the Grand Street Bridge to be recorded, due to the vibrations of passing traffic shaking and cavitating the 115 old swing bridge. The shot above looks southwards towards Brooklyn. 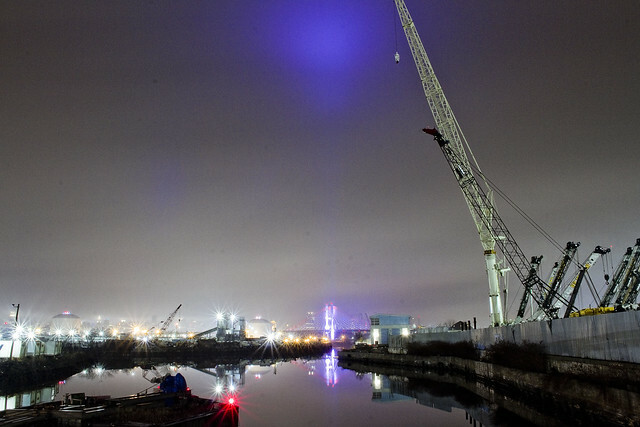 Looking roughly westward, you can see the glowing eidolon known as the new Kosciuszcko Bridge about a mile away, the crane district of Maspeth on the right, and the English Kills tributary of Newtown Creek’s intersection with the main waterway and the East Branch tributary at center and left. At the bottom of the shot, in the unnaturally green waters of the East Branch, a tepid current was pulsing out from under the bridge which was – from an olfactory point of view – obviously carrying sewage towards the main stem of the Creek. 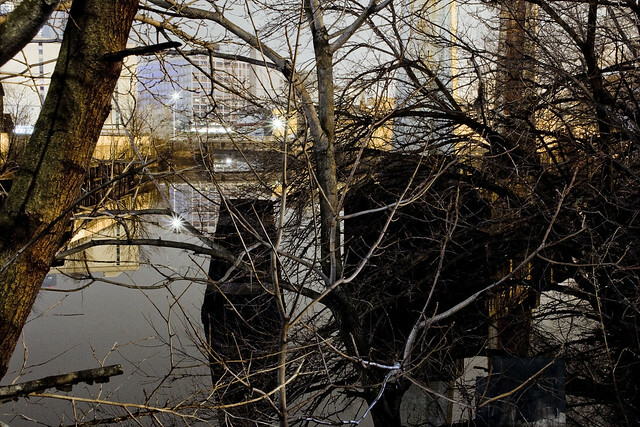 As a note, the water is lit up at the bottom of the shot by the street lamps of the Grand Street Bridge. 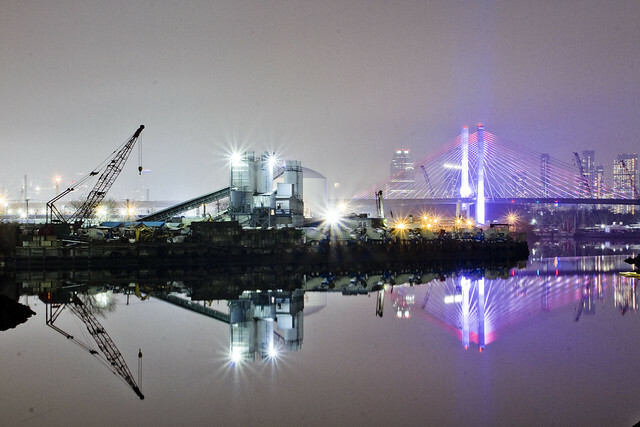 As intoned in a previous posting, concern about just how bright the light from the new Kosciuszcko Bridge is has been a subject of conversation of late – and more than once – amongst the Newtown Creek crowd. Light pollution, as it’s known, is meant to confuse the heck out of migratory birds. 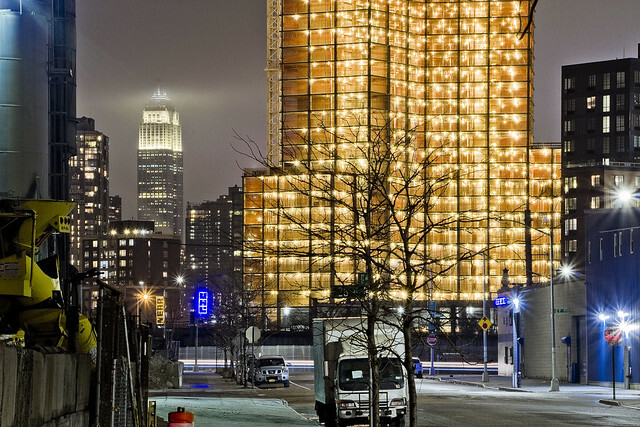 There’s actually initiatives at the “big” environmental groups to get Manhattan office buildings to dim their lights during certain times of the year in response. Given that Newtown Creek is part of the Atlantic flyover migratory route… well… who the hell cares – it’s Queens. I guess we’re just going to wait and see what sort of evidentiary observations emerge regarding its effect. Just saying… if I don’t know what something is and it’s flying, it’s a UFO. I’d suggest an Internet rabbit hole term for you to follow, by the way, which are “USO” or “unknown submersible objects.” Seriously, google that. Hours of fun. Personally, I’ve always gravitated towards more home grown and provable horror. Like the mugger gang that used to operate at the Brooklyn side of the bridge back in the 1910’s, using black jacks and billy clubs to induce unconsciousness in their victims. After emptying the stricken of the contents of their pockets, the gang would toss them into the creek. This is the 1903 version of the Grand Street Bridge pictured above, which the gang is associated with. This bridge replaced earlier models, as discussed in this post. In 1896, the cops found a Catholic priest name Leonard Syczek floating in the water alongside the 1890 version of the bridge, and wearing the sort of full ceremonial vestments required for conducting a Mass. There’s a story there which has never been fully revealed to me, but I suspect some sort of exorcism related tale will emerge eventually. Or, at least I hope one will. Due to my weird imaginings and remembered tales, a growing state of panic set in and I realized that one of my spells was coming on. Drops and spikes in cerebral dopamine levels began to occur, and suddenly I had to pee really bad. My feet grew cold, my nose flushed full with snot, and a single tear formed in my left eye bitterly. While composure was still mine, a phone app was engaged, and a driver was dispatched to shepherd me back to a place where doors can be firmly locked and vouchsafed against the outside world. 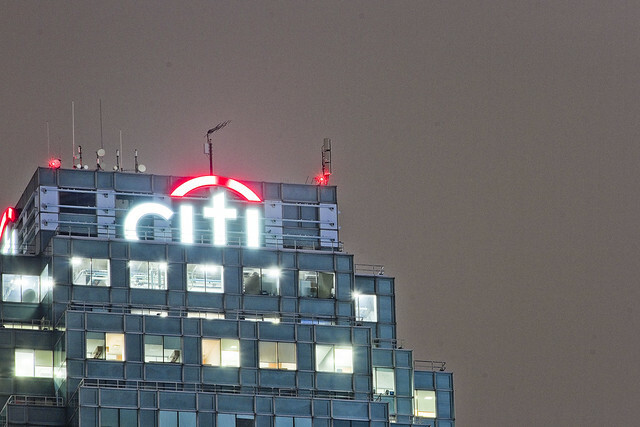 I left my shoes in the hallway that night, lest I track something in which I had picked up along the banks of the Newtown Creek on a foggy and unusually warm night in February.